The VigorSwitch P1092 is ideal for SOHO and small business networks requiring high-performance capability. 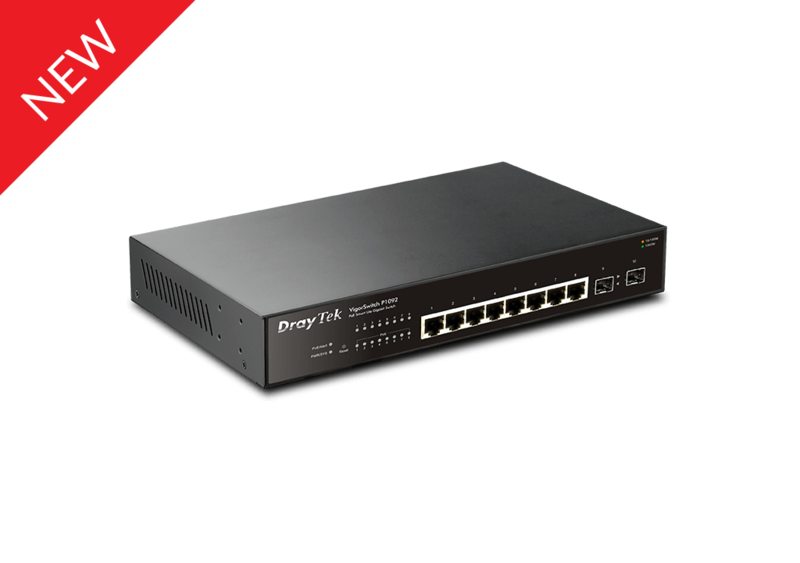 The VigorSwitch P1092 is an 8 port Power over Ethernet (PoE) Gigabit Ethernet switch with an additional 2 SFP ports for installation of optic fibre modules. Each PoE port can provide up to 30 Watts of power which is sufficient to power devices such as wireless access points, IP phones and IP surveillance equipment. With 20Gbps switching capacity and 14.9Mbps forwarding rate (64 bytes) this high-performance switch ensures rapid data delivery in modern day networks. The QoS feature can be used to prioritise application traffic on the network. Two Link Aggregation groups (GE7 / GE8 and SFP1 / SFP2) can be created to provide a high bandwidth link between cascaded switches. The 8 ports of the VigorSwitch P1092 are 802.3at and 802.3af compliant providing up to 30W per port along with a total power budget of 110 Watts. This is enough to provide power using Ethernet cabling for a number of network devices such as wireless access points, IP phones, and IP cameras. PoE allows installation of these devices where no nearby mains power is available. This results in a reduction in the need for power cables and adapters, lowering the cost of installation. The VigorSwitch P1092 complies with IEEE 802.2az Energy-Efficient Ethernet to provide power saving. The switch will automatically detect idle clients and cable length to adjust the amount of power required. This green networking feature reduces power consumption. The VigorSwitch P1092 supports both port-based and tagged-based VLANS which can be used to add security to your network and create workgroups within an organisation. This allows the network administrator to control LAN access and also reduce unnecessary network traffic. Up to 8 VLANS are supported in the VigorSwitch P1092. The VigorSwitch P1092 has a number of security features to prevent the local network being overloaded by superfluous traffic. This includes Storm Control to limit the amount of broadcast, multicast and unicast traffic on each port. Heavy LAN traffic can affect critical or time sensitive applications such as VoIP or video streaming. The QoS feature of the VigorSwitch P1092 can prioritise critical or time-sensitive data so that it will not be affected by other traffic. The VigorSwitch P1092 supports up to 4 traffic queues with customized weight to prioritise data using 802.1p CoS parameters. 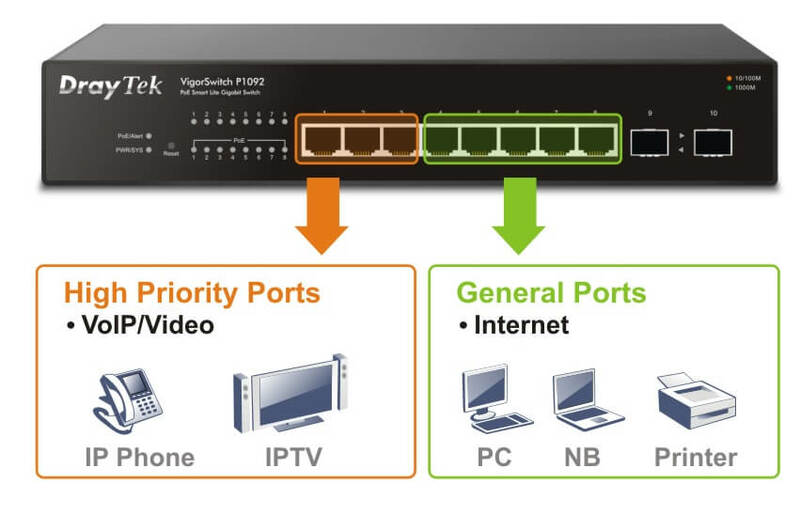 The VigorSwitch P1092 supports link aggregation using LACP (Link Aggregation Control Protocol). Two LAN ports (GE7 and GE8) and the two SFP ports can be grouped to provide two Link Aggregation Groups. This can be used to provide high throughput as well as link redundancy to cascaded switches. 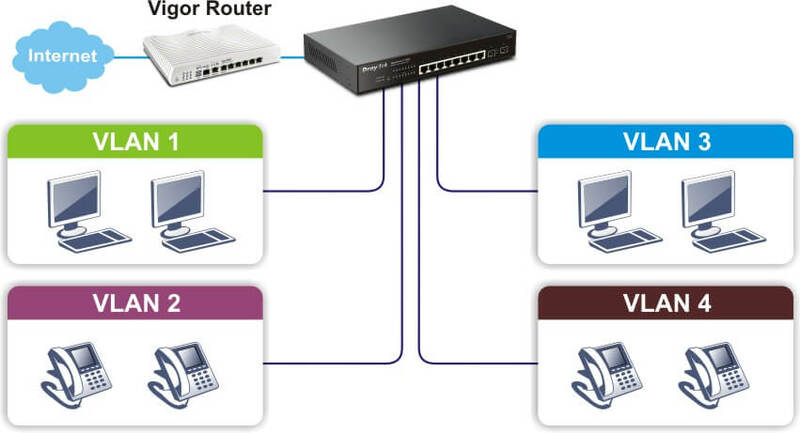 The VigorSwitch P1092 can be run in standalone mode and can also be managed using the Central Switch Management feature of Vigor Routers. This provides a central console to manage the VigorSwitches connected directly to the router. Functions that can be performed using Central Switch Management include provisioning, configuration, monitoring and maintenance of the VigorSwitch.